The reliable prediction of thermal loads in transition pieces is crucial to increase their life span. Power Systems Mfg. LLC (PSM) discusses best practices in transition piece design to allow aerodynamic pieces that optimize and combine improved cooling effectiveness with low pressure drop and reduced emissions operation. The transition piece (TP) is a critical part of a gas turbine, leading the hot gas from the combustion chambers to the turbine guide vanes. Due to its complex design, however, it experiences high thermal stress levels, limiting its life expectations and making it one of the most critical components of the entire engine. The reliable prediction of such thermal loads is hence a crucial aspect to increase the transition piece life span and to assure safe operation. Best practices when it comes to TP design – focusing on the selection of a cooling concept, optimal support design, and stringent airflow testing – is therefore of great importance. The common types of combustors in gas turbines in power generation are the can combustor, can-annular and annular combustor. Can-combustors are selfcontained cylindrical combustion chambers. Each ‘can’ has its own fuel injector, igniter, liner, transition piece and casing. The primary air from the compressor is guided into each individual ‘can’, where it is decelerated, mixed with fuel, and then ignited. Secondary air also comes from the compressor, where it is fed outside of the liner. The secondary air is then fed, usually through slits in the liner, into the combustion zone to cool the liner via thin film cooling. In most applications, multiple cans are arranged around the central axis of the engine, and their shared exhaust is fed to the turbine(s). Can-type combustors are easy to maintain and full size engine test is not required, instead a single can be tested in the test rig at full operational engine conditions. Can-Annular combustors are the most popular type of combustors used in gas turbines. They have discrete combustion zones contained in separate liners with their own fuel injectors. Unlike the can combustor, all the combustion zones share a common ring (annulus) casing. Each combustion zone no longer has to serve as a pressure vessel. The combustion zones can also “communicate” with each other via liner holes or connecting tubes that allow some air to flow circumferentially. The exit flow from the canannular combustor generally has a more uniform temperature profile due to the lean premix combustor designs used for very low emissions and must be taken into account for the lifing of the turbine section. It also eliminates the need for each chamber to have its own igniter in most cases. Once the fire is lit in one or two cans, it will easily spread via “cross-fire” tubes and ignite the other combustors. Can-annular type combustors are also easy to maintain and full size engine test is not required; a single combustor can be tested in the test rig and test data often used to estimate overall engine canannular combustion. Annular combustors have separate combustion zones and have a continuous liner and casing in a ring (the annulus). There are some advantages to annular combustors, including more uniform combustion, shorter size and less surface area. However, the maintenance of annular combustors is relatively more difficult, and their temperature and flow profiles are less favourable than can-annular combustors. Annular combustors will become more popular in applications having higher firing temperatures and low-Btu gases. Even though design is simpler, it generally requires a full size test rig for development. Almost 90% of heavy-duty gas turbines are can-annular combustors in the United States. The major components of a can-annular combustor include fuel nozzles, combustion liner/basket, combustion wrapper, combustion cover/support housing and transition piece. Due to their complex design from a circular inlet to 3D curved trapezium shaped outlet, severe thermal load is inevitable in the transition piece. The reliable prediction of these thermal loads is therefore a crucial aspect to increase the transition piece life span and to assure safe operation. Power Systems Mfg., LLC (PSM – Ansaldo Energia Group) has therefore set out what it believes to be the best practices in can-annular combustor transition piece design including PSM’s family of TPs, unique features, patents, analytical predictions and design validation with thermal benchmarking, cooling air consumption/leakage benchmarking and the importance of Consolidated Lifetime Statement (CLS), where analytical results are combined with current field experience to create a consolidated estimate of a transition duct’s true lifetime capabilities. The TPs are designed to meet lifetime targets while also conforming to aerodynamic constraints such as flow optimization of the transition shape, optimizing cooling design, pressure drop, emissions, and overall temperature profile (OTDF) and radial temperature profile (RTDF). Important features of a TP include cooling schemes, aft-mounting, forwardmounting and the vane seal system (see Figure 1). Several cooling schemes have been used in TP design. In the early classes of GTs there was no active cooling on the TPs and the design relied heavily on high temperature alloys such as Hast-X. The next generation of TPs added thermal barrier coating to the aft-end. For GE’s F-class design they added an outer impingement shell, which uses a portion of the combustor air flow to first impinge and channel cool the inner/hot duct prior to entering the combustion reaction zone. This method is less effective for cooling compared to effusion but can help reduce emissions since it keeps cooling air from being injected downstream of the reaction zone. However, with impingement-cooled TPs, the addition of an outer impingement skin requires careful handling of the vibratory stresses due to combustion dynamics. Special attention is required in the design of the impingement skin including the mounting scheme to avoid HCF (High Cycle Fatigue) failure. Another design, featured in some of the 501F fleet, uses internal channel cooling panels along the flow path. This design can be a great heat exchanger but has demonstrated outboard body panel cracking. The most common cooling scheme used extensively is effusion cooling, where a series of rows of effusion holes are drilled at a compound angle to the duct flow. This scheme is used extensively by PSM on 501F, 501D5, and 501B6 turbines as well as PSM’s performance upgrade packages (GTOP) TPs used on the 7FA and 501F. Most TPs use a single-point bendable flange for aft-mounting. GE’s 7FA uses a Barnes mount (the name of the inventor at GE) and PSM uses an improved patented mounting technology to overcome the failure issues at bending of the mount location (see Figure 2). PSM developed a thermally-free “bulkhead system” that allows hot duct expansion with respect to bulkheads. Being at a relatively cold compressor discharge temperature (CDT), the bulkhead could bridge-support the exit window against the duct’s pressure load without inducing thermal loads (see Figure 3). A 501F TP uses a flexible bullhorn with no slide mount; most of other TP designs use sliding bullhorns. PSM uses a pin bullhorn for mounting forward end of TPs. This arrangement is modally rigid, dimensionally tight and easily repairable through flared inserts and pin replacement. It also addresses wear and loose mounting issues of some existing TP designs (see Figure 4). There have been a variety of seals (TP to first vane) over the years. The first system was a Westinghouse floating seal but this had high leakage and resulted in high wear on the vane and seal. GE developed a more lightweight version for the 7EA and a more flexible version for the 7FA sealing system. PSM developed a multi ply seal for the 7FA and 7EA based on their patented 501F vane seal. PSM also developed a honeycomb sealing system which bridges and complies with the leading edge of 1st vane platforms (7E, D5, B6, SW501F, M501F and GT-36. See Figure 5). The PSM M501F TP was designed in 2010 and has been running in the field since 2011. It is a sister design to the PSM SW501F TP, which has been operating in the field since 2002. It utilizes PSM patented technology used on many PSM TP designs such as the: thermally free aft Frame for a transition duct; transition duct mounting system; and transition duct honeycomb seal. During the design of the PSM M501F TP, the fleet experience of the PSM SW501 TP was heavily utilized. Extensive 3D CFD analysis was carried out for PSM’s M501F TP using Ansys and Fluent. A k-ε turbulence model – the most common model used in Computational Fluid Dynamics (CFD) – with methaneair three-step chemistry was used for the simulations. Boundary conditions and cooling flow distribution was based on validated flow data from field benchmarking. TP inlet conditions consisted of velocity and temperature profiles, which were based on the PSM SW501F combustor CFD simulations. Boundary conditions for thermal analysis were based on CFD analysis. Thermal-structural analysis is performed on the TP for component life prediction using PSM’s proprietary PSM Life code. During the first set installation of the PSM M501F TPs, two combustion cans and TPs were instrumented with pressure taps and temperature probes for analytical model validation (see Figure 6). The initial benchmarked models from the previous PSM SW501F TP showed a good match and only required slight modifications to account for the engine and combustor operational profile difference between the SW501F and M501F units. Thermal simulation models were updated based on new benchmarked data; structural analyses were rerun to estimate the impact on life predictions (see Figure 7). Another key aspect of the PSM TP design practice is the cooling air consumption benchmarking of the PSM TPs compared to OEM parts. During the design process both geometric and aero-thermal characteristics critical to the form fit and function of the TP are characterized. 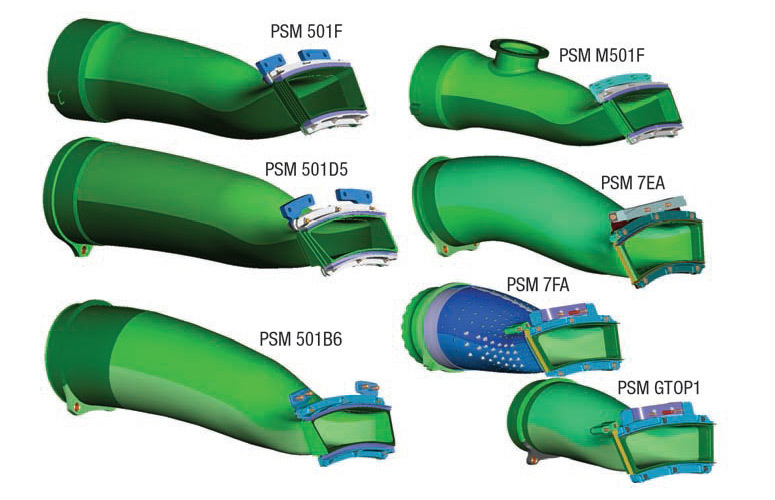 During the design of the PSM M501F TP the OEM TP cooling and picture-frame seals were characterized using PSM proprietary blowdown flow bench and flow fixture technology (see Figure 8). Individual cooling circuit flows are flowed to target pressure ratios simulating the full scope of engine operating conditions. The TP picture-frame seals, TP side wall to TP side wall, and TP to first vane seals also play a major role in overall air consumption of each TP within the combustion system. This information is then used to optimize the designed TP cooling, seal leakage, and overall combustion system air distribution models. As part of the overall design and validation process, data from TPs in the field is gathered and assessed. The result of this assessment is a “Consolidated Lifetime Statement” or CLS, where analytical results are combined with current field experience to create a consolidated estimate of a TP’s true lifetime capabilities. Since many of the TP designs share novel features as discussed, evaluating the features historical performance is a useful tool during the development process. Field data to support the CLS is gathered from many sources of varying fidelity and level of detail including in-situ inspections, part reconditioning, and outage reports. In-situ inspections are usually regularly scheduled borescope and/or visual inspections. The regular intervals provide helpful data for identifying an initial failure point and trending distress over time – including coating loss, large cracks, heavy oxidation, and heavy wear – but the assessment is mostly qualitative. Part reconditioning inspections typically take place after a part’s full operating interval. Since the part will be repaired, the level of detail of the inspection is very good, utilizing techniques such as liquid penetrant inspection and X-ray to assess part distress. The results of the field data collection can be compared back to the original development analysis. An example is shown where field distress of an OEM component is compared to an analysis of the component. It shows that the analysis accurately captures the high stress location, giving confidence to the selected boundary conditions and modelling assumptions (see Figure 9). It is important to feed this information back into the design process for new transition ducts as a way to highlight field issues that need to be addressed, distress modes not well captured by analysis, and areas where analysis may be overly conservative. As the multiple types of transition ducts accumulate operating time and cycles in the field, the CLS is continuously updated. In addition to distress tracking, the CLS data can be used to improve and update design practices, and as part of lifetime extension assessment. Key design limits such as thermal gradients and temperature limits in the transition duct base metal and the thermal barrier coating, etc., based on the CLS are used to gauge risk during the development stage of a new transition duct design and to gauge the risk of extending operating intervals and reducing intermediate inspections of mature transition duct designs. Overall the CLS is a useful tool in transition duct development and is a key part of design best practices.